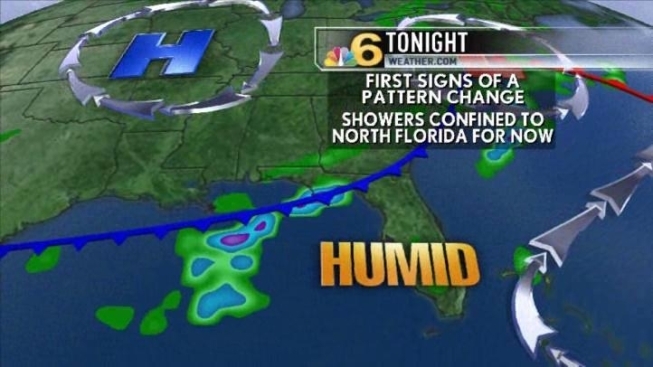 The first signs of a weather pattern change could be felt Thursday and Thursday night in South Florida, as the air became a bit more humid. Friday and Saturday are both expected to be partly cloudy, and a slight chance of showers crops up in the forecast both days. Highs will be in the low 80s, and nighttime readings won’t dip much below 70 degrees. Then on Sunday a cold front is expected to tap into the increasing moisture and produce a scattering of showers, perhaps even a thunderstorm towards midday or afternoon. While this may interfere with some outdoor plans, the good news is that the front will make a clean sweep through Florida, allowing for skies to clear on Sunday night. On Monday, Presidents’ Day, the weather is expected to be sunny, with comfortable high temperatures in the 70s and low levels of humidity.